The Washington County Board of Supervisors canvassed results from July’s special election for the Washington Ward 1 city council seat. Danielle Pettit-Majewski won the seat with 54 votes, ahead of Mark Kendall with 36 and Dave Mueller with 25. Voter turnout included 10% of those registered in the precinct. 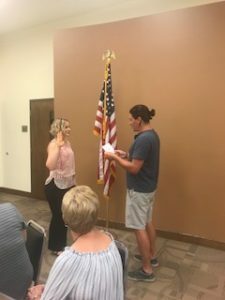 Pettit-Majewski was sworn in at the July 17th meeting of the Washington City Council. Her term ends December 2019.